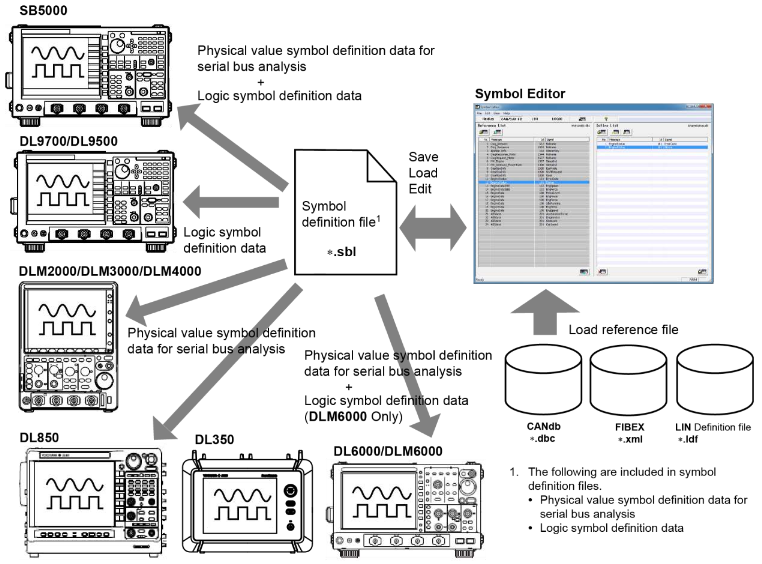 This software is for creating and editing physical value symbol definition files for serial bus analysis based on data below. Capable of loading signal definition files (.dbc) created using Vector Informatik CANdb++ or CANdb, and creating/editing physical value symbol definition data for CAN/CAN FD analysis which can be used on applicable products. Capable of creating/editing physical value symbol definition data for FlexRay analysis which can be used on applicable products. Capable of loading LIN Configuration Language Specification compliant LIN Description files (LDF: LIN Description File), and creating/editing physical value symbol definition data for LIN analysis which can be used on applicable products. * FIBEX (Field Bus Exchange Format) is one kind of common data base (format) used in bus systems such as FlexRay developed by the ASM consortium when exchanging data and information between nodes (ECU, etc.). It defines data (messages and symbols), information about the sending/receiving nodes, and other information in the xml language. Below are products capable of loading symbol definition files and type of supported signal. Microsoft corporation's MSXML 6.0 must be installed to use the FIBEX file import function. Version 3.73 or later is required for DLM2000. Version 3.73 or later is required for DLM4000. Version 2.00 or later is required for DL850V. Drag & drop of related file (dbc/ xml/ sbl) to list window is supported. Editing file name and indicator are displayed at the top of list window. Manual sort function by drag & drop of definition list is added. FlexRay symbol definition function is improved by FIBEX. Version 4.42 or later is required for SB5000. Version 4.20 or later is required for SB5000.